It isn’t news that the Mexican White Wing dove has flown its Mexican coup, probably because of the violence, and is now setting up huge colonies in the Houston area. I have just discovered an astounding fact. The white-wing dove eats the seeds of the Chinese Tallow Tree! Now, it has been my contention all these years that the Tallow tree is totally worthless. Okay, save for the fact that it might be the only tree in Houston that truly turns into colors in the fall. So for all those of us native Houstonians who have bemoaned the lack of fall color in our landscape – look around at the Tallows. I just saw a purple one yesterday. They do turn purple, red, orange and yellow sometimes all at once, and on one tree. Other than that bit of something, the Tallow being a non-native to America has never contributed to the wildlife food chain. Nothing will nest in it, except a perhaps a newbie crow or some such bird who learns soon enough not to ever do that again. Brittle Sticks! But now, these new big doves eat the seeds. Nothing else eats the seeds, nothing else uses the tree, for anything. It’s like a huge deal. This is big news. Big. The other new thing is the brown lizards. I don’t even think they have a name. I’ve been researching them. Can’t find them. They are too new for a name, I suppose. They must have a name somewhere but not in Houston. Here in Houston we have green Anoles, we used to call them chameleons because they change color. You know the lizard they magnified in the old movie, Journey to the Center of the Earth? That’s what the Green Anole looks like. They’re cute. We have horny toads, too, though rare. Don’t laugh. They are stickery. Then we have the relatively new Japanese House Gecko, which looks nothing like the Geico gecko. These have clear skin over their stomach and you can see their insides. They chirp. They run really fast, like a roach. And the fact that they come out at night and crawl across the porch ceiling doesn’t help their image. They came over on cargo ships like many of our non-natives species come, whether intentionally or not. Obviously lizards were not an intentional shipment. The new brown lizards are small, fast and hang out in the heat of the day like a desert creature might. Their colors range from dark to light and they have some light markings. The distinguishable coloration is the light strip down a bony ridge of a backbone. 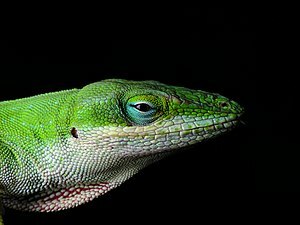 Unlike the Green Anole, their mouth is blunt tipped. I haven’t seen any leave part of their tail behind when chased like the Green Anole does. I wonder what the brown lizard’s impact will be on the biodiversity of my yard. Is it a predator of insects like the other lizards or is it a predator of other lizards? I have seen a decline in the Anole population but that can be due to the hugely wet summer and then the long dry spell we are experiencing now. Will the brown lizard wreak havoc on the toad population? I haven’t seen many toads at all. Will the brown lizard ever receive a name? Has anyone else seen them? And will the abundant and voracious white-wing dove eat the brown lizard? I’ll just have to watch to find out.